After Christmas I packed and sent off materials for workshops in Washington next week. 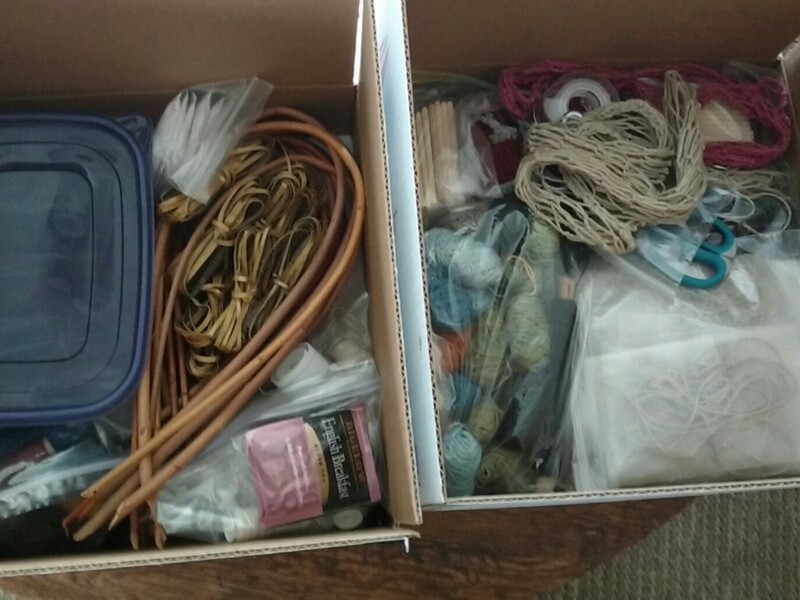 I managed to fit materials for five workshops at the Northwest Basket Weaver’s winter retreat in two flat-rate Priority Mail boxes, with just enough room to slip in a few tea bags. Packing light is a skill developed through practice, and I’m always learning. 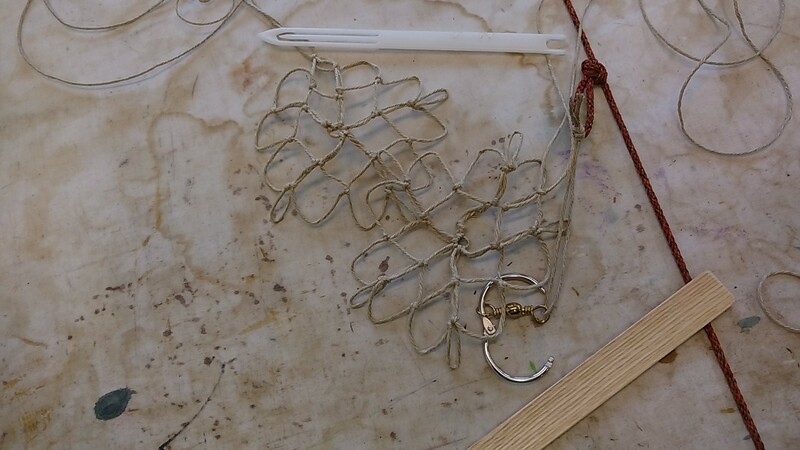 It may take me a bit longer to set up for the netting class, since I decided not to ship the homebrewed tension jigs I like to use (heavy) or C-clamps (heavier). But students will be able to keep the cord I sent instead, and I’ll teach them how to tie a tension aid themselves (that trucker’s hitch is a useful knot). As long as I remember to tie in their swivels when I set up the class, it may work better than simply doing it the way I’ve always done it. I learned years ago from other basketry instructors to be careful about packing anything that might be damp. 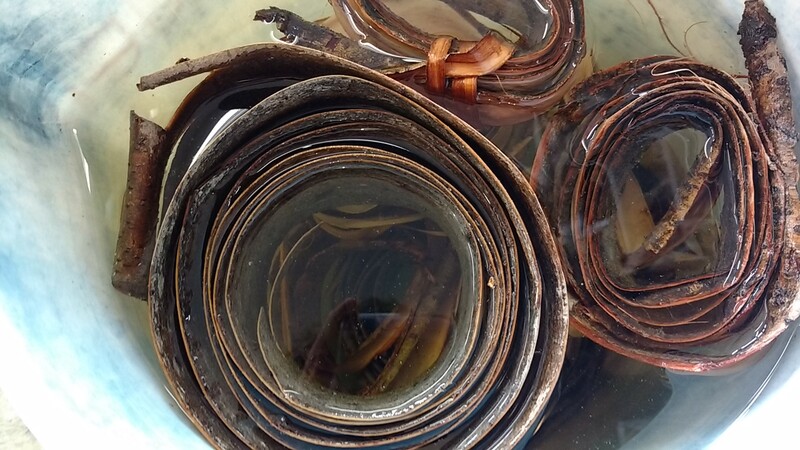 So the willow bark I cut into strips for a Fuegian coiling workshop did not go into a plastic bag, even though I was quite sure it was dry. Packing clothes is another matter, and I make no claims to mastering lightness there. On frequent trips to Florida to visit my parents, I’m able to travel with a backpack and a large purse. I seldom take my rollaboard bag because it won’t fit in the overhead compartments on the smaller jets that serve my regional airport. So it has to be gate-checked, and I’ve nearly missed connections waiting to retrieve it. It’s going on this trip, though, filled with looping samples for a lecture. I pared down the samples to make room for one or two of the bulkier layers I need for winter travel. Trust me, this is nothing compared to some of the packing I’ve seen from other instructors in my travels over the years. I’ve learned so much from them, and am always grateful that I don’t have to pack spools of wire or a sewing machine!